Your kitchen is the heart of your home. From breakfast to an evening meal, everything goes through the kitchen at some stage. While decorating, consider that all the objects in your kitchen are essentially competing for your attention, from shiny appliances to a fridge covered in colourful magnets. Choose fun and expressive artwork for your kitchen – it’s an entertaining space! Get your family to help you pick the artwork. When choosing colour, get inspiration from a colourful object in your kitchen. If you have an interior theme such as vintage or country cottage, reflect this in the artwork you choose. If your kitchen has lots of light streaming through the windows, choose non-reflective glass for framing. If you have chosen photography or a drawing, make sure it is very well sealed and protected from steam. Always buy art you really love, and not because you think it may be an investment. 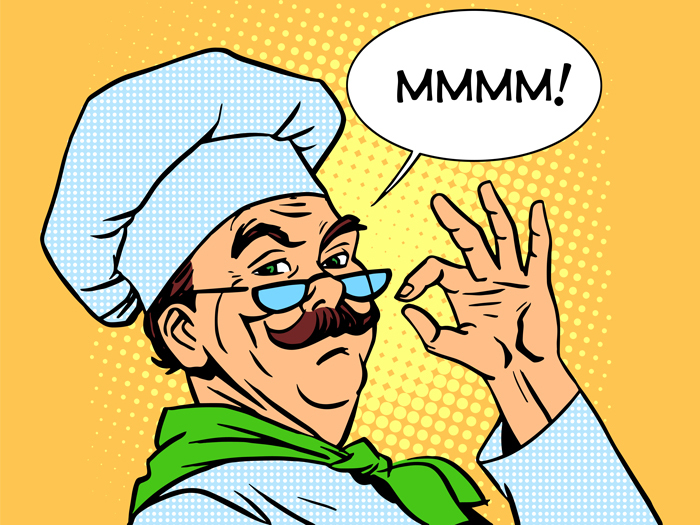 Let’s take a look at examples of art that can be as tasty and expressive as the food you make. 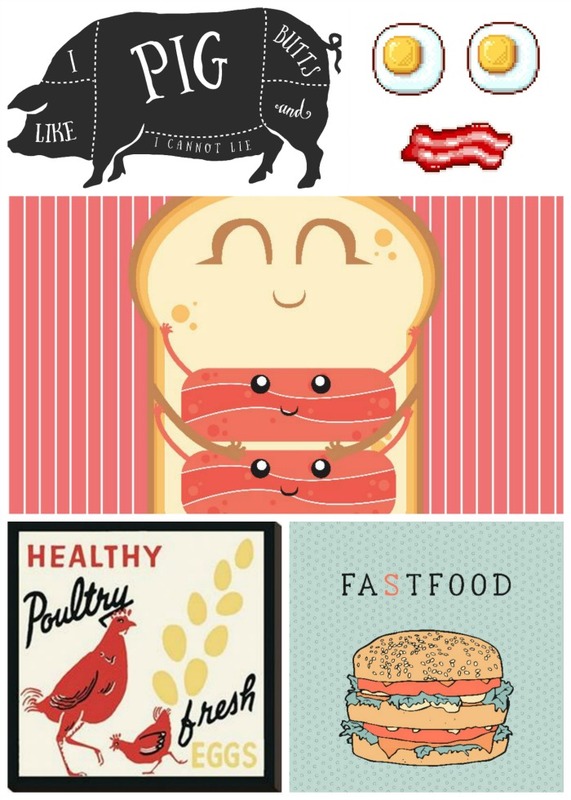 Pictures can serve as inspiration for future meals, below we look at some examples of the art one’s kitchen can be decorated with – inspired by our ‘Hug the Bacon’ month. White, grey, blue, red, yellow, and green really shine and make a kitchen feel warm and inviting. 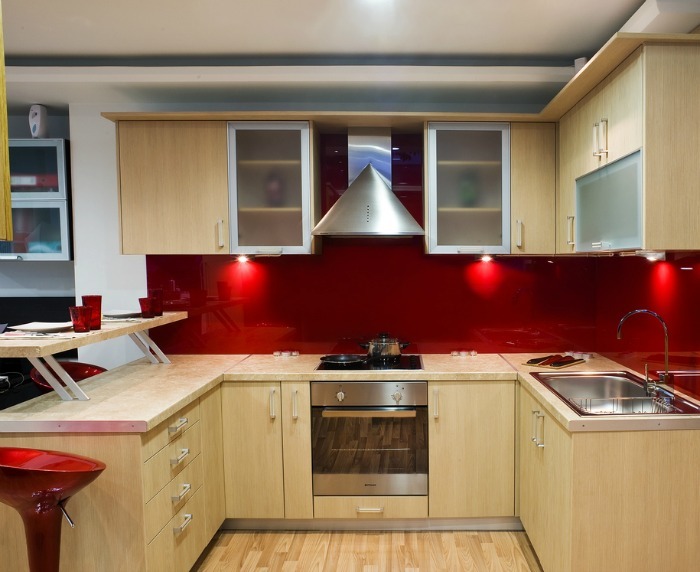 Red in particular is believed to stimulate the appetite, and can come in a range of different shades to really make your kitchen pop. Remember that since the kitchen is a visually busy space, letting the art spillover onto adjacent walls or into a living room would tie the theme and colours together.